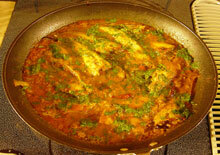 Cooked with ample quantity of onion, fish peyaza (or do-peyaza, if you wish) is a delicious fish preparation. Any fresh water fish can be used and we have used Pabda fish for our recipe. Beside the taste of the fish, scientific studies have confirmed the beneficial heart healthy effect of fish oil (omega 3 fatty acid) in reducing bad cholesterol level. In this age of obesity, over weight and diabetes problems, eating fish instead of red meat is a choice one should consider seriously. (1) In step one, the fish will be marinated with salt and turmeric powder and then left for 15-20 minutes. 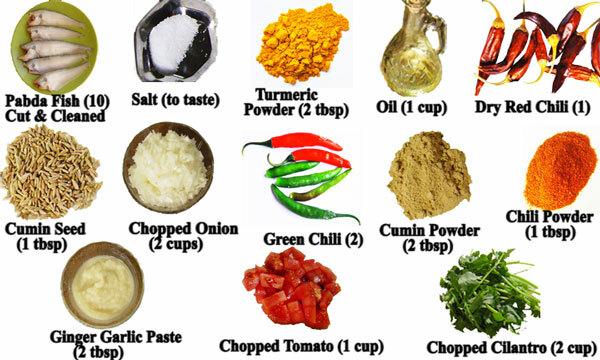 (2) The spice mixture will be fried with chopped onion and tomato and a gravy will be created. (3) And finally the fish will be added into the gravy and cooked to completion. 1. Add salt and turmeric powder in the fish and marinate uniformly all over. 2. Leave the marinade aside for 15-20 minutes. 3. In a moderately hot pan, add 3 table spoons of oil. 4. When the oil becomes hot, add the fish and fry them uniformly (for about 15 minutes). 7. Remove the fishes from the frying pan and leave aside. 8. Heat 3 table spoons of oil, either fresh or left over from frying the fish. 9. Add a dry red chili. 11. Add the cumin seeds. 12. When the cumin seeds start sizzling add the chopped onion. 14. Add 2 green chilies. 16. Continue stirring till the onion become golden yellow. 17. Then add the cumin powder. 18. Add the turmeric powder. 19. Add the chili powder. 20. Add the ginger-garlic paste. 21. Stir well for couple of minutes. 22. Add salt and mix. 23. Then add the chopped tomato and mix them all. 24. Continue stirring for several minutes till the tomato mixes with the spices creating a thick paste. 25. Add a cup of water. 27. Continue heating till the gravy starts to boil. 28. Then add the fried fish. 29. Spread the fishes evenly in the gravy. 30. Cover the pan and bring it all to a boil. 31. When the gravy attains desired consistency remove the pan from heat. 32. Add the chopped cilantro. This completes the fish peyaza preparation. It takes about 45 minutes to prepare. And serves 4-5 people. Serve the fish peyaza hot with steamed white rice.